A team of mountaineering expedition of 1st Battalion Ladakh Scouts Regiment on October 3 was flagged off by Lt Gen SK Upadhya from Leh to Stok Kangri located at 6153 meters in Ladakh. The team successfully summitted Mt. 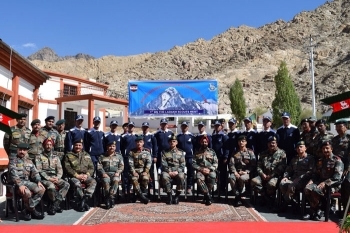 Stok Kangri on October 12 which was flagged off by Maj General Kulpreet Singh on October 13 at Ladakh Scouts Regimental Centre. The expedition is to exhibit the adventurous spirit of the Indian Army. The team 18 members are led by Lt Col KT Stobdan of 1st Battalion Ladakh Scouts Regiment. The expedition team has undergone three weeks arduous physical and technical training under the guidance of able instructors prior to the expedition. The team will move to Stok village and there onward the team will embark on a challenging expedition route towards the summit of Stok Kangri (6153M) and will set up three camps including a Base Camp. The troops of the Ladakh Scouts Regiment are known for beating the most difficult challenges of conquering the indomitable peaks of Himalayas. Stok Kangri (6,153 meters (20,187 ft) is the highest mountain in the Stok Range of the Himalayas in the Ladakh region of northwest India.